Don't miss out on Vancouver's latest party sensation. We are booking birthday parties now for the 2018 season. Ye best be booking now, and be sure to ask us about our exclusive adult party packages. Arrgh, our birthday parties be a fine way to celebrate the youth in all of us! 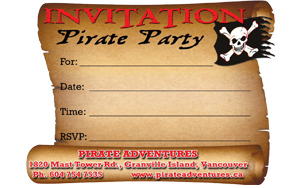 At Pirate Adventures Vancouver, we offer four great birthday packages to choose from. Food and beverages are permitted on the Captain Terrible Terry's and Pirate Crew packages, as you have the exclusive use of the ship. This special includes all the fun stuff listed in our standard party package. While onboard the ship, the birthday boy/girl will be treated with a special pirate rendition of "Happy Birthday". During the theatrics, special attention will be directed to them to ensure a memorable day. This package includes 20 guests for $519.99. Tables may be available after your sail — call for details. 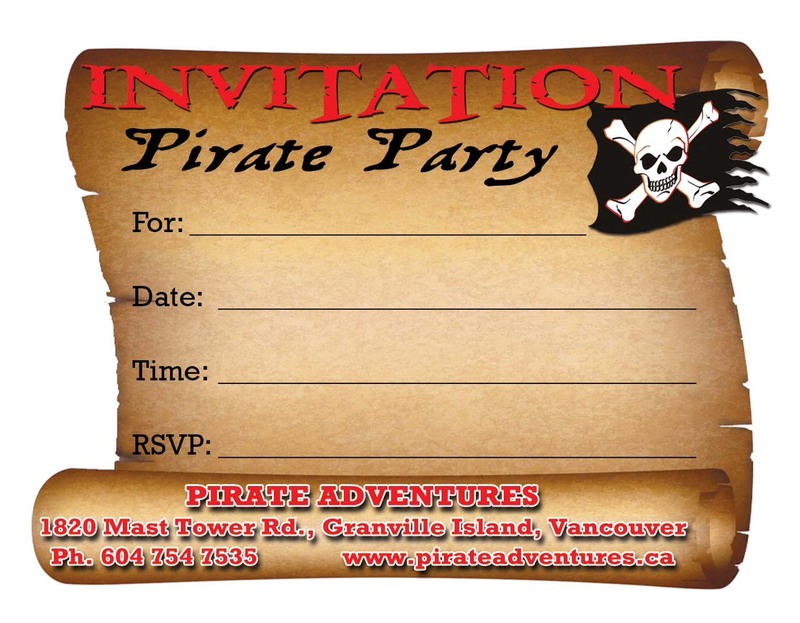 This special includes all our standard package items, including the special birthday celebration with special attention during the theatrics, along with up to 12 Pirate themed loots bag for the party goers at the end of the voyage. The package includes 20 guests for $599.99. 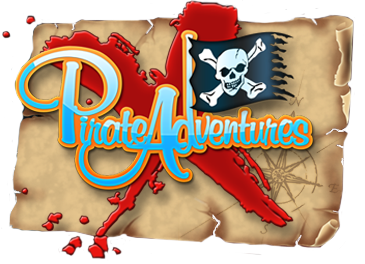 Please Note: For both the Pirate Pete and Swashbuckler specials, additional guests can be added for $28, with extra loot bags at $9.99 per additional bag. Tables may be available after your sail — call for details. Our pirates particularly enjoy this package! 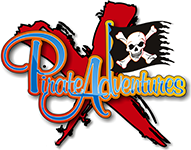 The entire boat is reserved for your family and friends, allowing the crew the opportunity to personalize the adventure for the birthday pirate and family. Arrgh, the Captain likes this package! 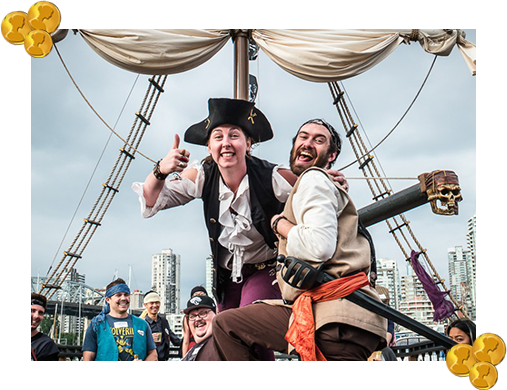 Not only do you get the entire boat for your family and friends, our Pirates will join the voyage regaling you with a ballad or two for the enjoyment of your entire group. 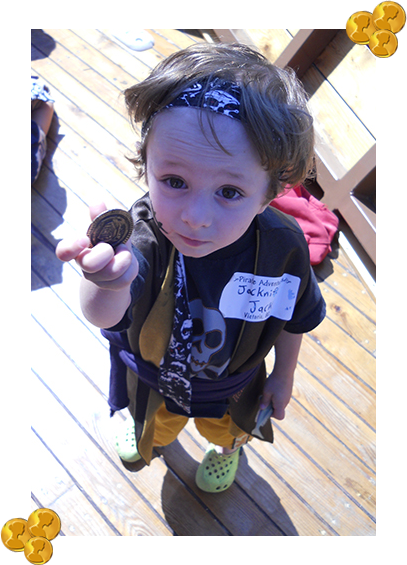 In addition to our standard package items, this package also includes up to 20 pirate-themed loot bags for the party goers. You are also welcome to supply your own food or celebration supplies while onboard the ship. This includes 42 guests for $1,229.99. A) Allow yourself more time to celebrate that special moment! On our private party packages only, for an additional $500, you may have the choice to add an extra 45 minutes to your time (resulting in a total of 2 hours on the ship). Please give us a call for availability. B) Additional Pirate Gear (Including One Eye Patch, 11" Sword Replica, and Pirate Themed Bandana): Only 12.99 Per Pirate. C) Pirate-Themed Piñata (with Candy, Gold Doubloons, and Jewels) Hung Ready Onshore at the Waterfront for Your Afterparty Celebrations: Only $59.99. On our exclusive private birthday packages a 10% gratuity is recommended and appreciated.